When your child is born with a complex medical condition decisions regarding which treatment route can be extremely difficult. With Callum's condition his parents had to make the difficult decision to allow surgeons to perform a new technique in spinal surgery, for the very first time, in Birmingham Children's Hospital. Callum's father Peter Read explained how fortunate they feel to have been in the right place at the right time. "Callum was born with Kyphoscoliosis which means he has not only a curve but also a twist of the spine. He also has some ribs missing too from birth and he has an operation to try and correct that on a regular basis. They discovered this when he was in the womb from a scan where they could see there were some anomalies. They carried out further investigations and realised that he had some form of scoliosis. It meant that the pregnancy was not the smoothest and it obviously caused a lot of heartache and stress for me and Callum’s mum, Lucy. We were lucky that we were in Birmingham because we had two fantastic hospital’s nearby in terms of Birmingham Children’s and also the surgeon’s that came to carry out Callum’s operations on his spine are from the Royal Orthopedic in Birmingham. It was the right place and also the right time because they had developed a new form of operation in a children’s hospital in Texas that they were just about to trial in Birmingham. Callum was the first baby to have that operation done. It meant they put titanium rods into his spine to support and try to correct the twist and the curve. We were very lucky in lots of ways. It is a very rare condition and we have never met anybody else with this condition and we are in hospital a lot. From an outsiders perspective Callum looks absolutely fine, just slightly small for his age but that can happen to lots of children for any number of reasons. The Kyphoscoliosis isn’t apparent to anybody who doesn’t know about it. In that respect he is treated completely normally. More awareness of rare diseases is really needed. In a lot of cases it might be obvious to people that a child has a rare disease of some sort but this is not always the case. It is important that they have a support network that they can rely on allowing them to talk about the experiences they have been through, not only the children but parents and their siblings too. The Rare Disease Centre at Birmingham Children’s Hospital will really help with this when it is open. We have been very lucky in the support we have had from our employers and this has been great. 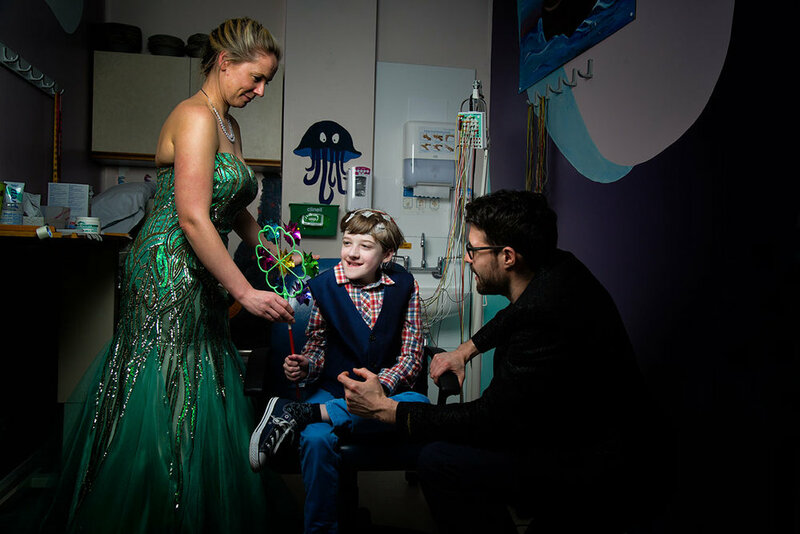 We always felt that we wanted to be with Callum in hospital and the good thing about the children’s hospital is that one parent can stay with the child overnight and we have always done that. Our employers have been very helpful in giving us both the support we needed through flexible working when required. In terms of the emotional impact I think that mother’s do have it worse because sometimes guilt and that associated side of things. The pregnancy was very difficult, for Lucy in particular, but we do talk and support one another. The hospital has been great at helping us too and we knew what we would be facing in advance. It really helped."